How does penne pasta sound? Yes, you got it! 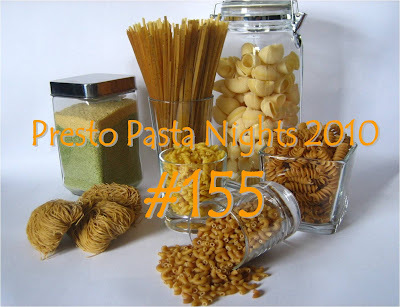 I am this week's host for Presto Pasta Nights - 155. All you have to do - just bring them out - pastas or noodles and dress them up any way you want to: soups, starters, main course or even dessert! Go classic Italian or draw inspiration from any other cuisine. Need more details? Just hop here . Don't have a blog, but have a super recipe that you want to share? Just mail me the recipe and the picture! PPN #155 runs between March 12th - March 18th. Check back on the 19th for the round-up. Looking forward to your delicious entries! HBDTU!HBDTU!! May God bless u! The theme looks great...happy hosting! Great announcement. Thanks for hosting this week's PResto Pasta Night. Alright. Time to put my pasta thinking cap back on. That poem is so cute! Love the poem! If that doesn't bring out the kid in all of us, nothing will. Loved ur poem dear ..
hey iam hosting a giveaway if ur intrested pls stop by at my blog if u get a chance .